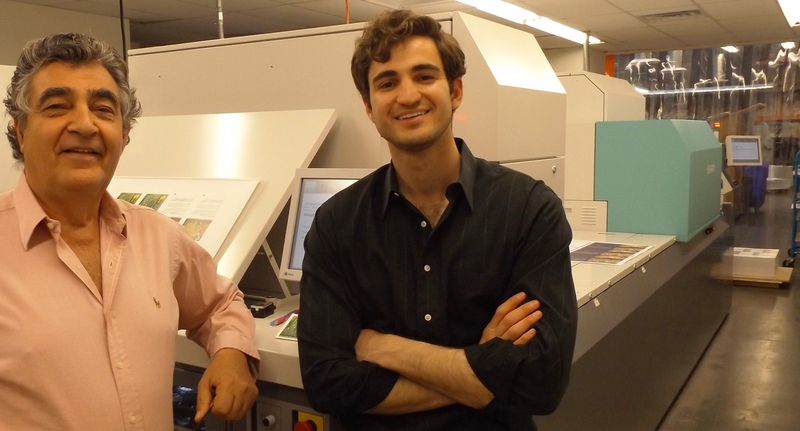 FUJIFILM North America Corporation, Graphic Systems Division’s J Press 720S has further enhanced the capabilities of Haig’s Quality Printing, a Las Vegas-based print service provider with a worldwide reputation of bringing design elements to life through technology. As one of the largest, full-service independently-owned commercial printers in Nevada, Haig’s Quality Printing is a G7 Master Printer, featuring an impressive and ever-growing client roster of well-known names in the entertainment business, casino industry, and government entities. Built from the ground-up through a commitment to hard work and fidelity to company values, including uncompromised quality, Haig’s Quality Printing has turned a manufacturing process into a unique art form. Haig Atamian, pictured with his son Garo, and their J Press 720S at the Las Vegas facility. With a 29.6 inch x 20.9 inch sheet and an output of 2,700 sheets per hour, Fujifilm’s second generation sheetfed inkjet J Press 720S is an ideal solution for printers like Haig’s Quality Printing who are looking for products in conjunction with its current capabilities that feature the quality and robustness of an offset press, and the versatility to handle even the shortest of press runs. New opportunities and increased revenue in the short and medium-run market equate to further success at Haig’s Quality Printing. “We do a lot of enhancements, including special coatings and foil stamping; without perfect registration we simply could not do what a customer expects, versus what is possible. We take it to the next level, over the top,” said Garo.